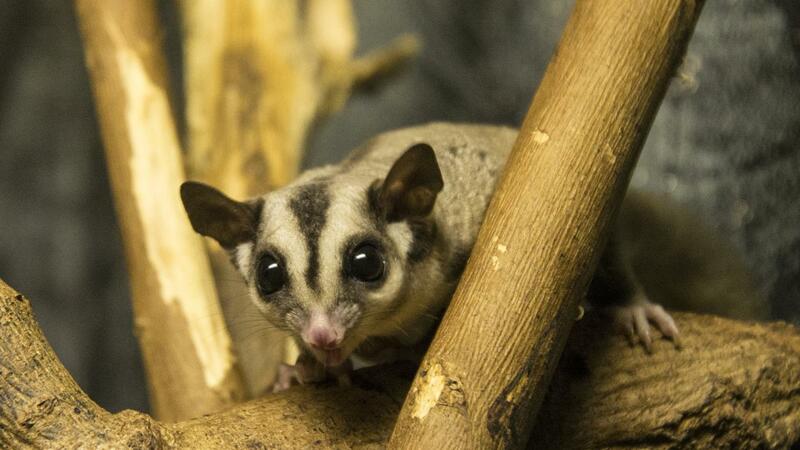 Sugar gliders live in wire cage enclosures that are at least 2 feet long, 2 feet wide and 3 feet high. Typically, the bigger the cage, the better. Not only are big enclosures ideal for sugar gliders, but the wire should be 1/2 inch wide. Wire mesh is the ideal material because it allows the sugar gliders to climb up the sides. If the wire is not mesh, it should have horizontal bars to aid in climbing. The wire needs to be spaced 1/2 inch to 1 inch apart, depending on the type of bars. The enclosure also should have a couple of platforms of varying heights. Cages for sugar gliders should have small nest boxes made out wood, plastic or cloth bags for defecation placed on the highest platform against the ceiling of the cage. Enclosures should also include a variety of toys, branches and ropes to simulate the animal's natural habitat and an exercise wheel. Sugar gliders are small marsupials native to Australia that are popular in the exotic pet trade. They can glide from tree to tree, making a big cage where they can do this necessary. They also need plenty of social interaction. Where Do Three-Toed Sloths Live?